Protein Shakers There are 6 products. 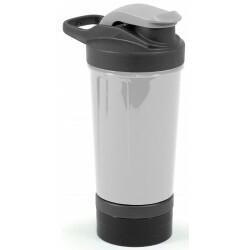 500ml shaker with mixer - 3 screw compartments to hold powder or other supplements. Simply add ingredients and shake bottle.Lid is removable with snap on cap. Dishwasher safe. Mix your favourite drink, sauces and dressings. 450ml Shaker Bottle. Flip open/close top lid. Comes with stainless steel ball. Detachable sealed container on the bottom has a place for your powder and a handy compartment for your supplements. This handy bottle provide style, flexibility and above all mixes like the boss! Premium 600ml stainless steel drink mixing shaker with a smart matt finish. It has a secure screw on lid with a snap closure and unique built in mixing blades which help to break up powder granules. It has both metric and imperial graduations and is presented in a black gift box. Handwashing is recommended and it is BPA free.